1The Jātakas, “birth-stories” or tales of Gautama Buddha’s past lives and appearances both human and animal, constitute the main fiction genre of the Theravada Buddhist literature and serve as mediators of knowledge between the different components of Buddha’s teaching and related life principles. Besides the semi-canonical Jātakatthavannanā, the largest and most prominent collection composed in Pāli, there exist other Jātaka stories either organized as collections or scattered in other early Buddhist texts1. The interest for the Jātakas has never faded, not only in South and South-East Asia where they were born and circulated, but also the world over. 2The Jātaka tales’ main theme can be defined as Bodhisatta’s (Buddhato-be) determination to teach his principles to the world while building the strengths, resources, and experience ready for his final birth and enlightenment. In his many lives, he dons various appearances including animal ones. When human, he embodies many different classes and nevertheless fulfills all the ten god-like perfections, generosity, virtue or restraint, renunciation, wisdom, effort, forbearance, truthfulness, resolve, loving kindness and equanimity. 3These tales from the far away past (between 4th century BCE and 5th century AD) have been retold, rendered, or adapted, and appear thus in a great number of versions, variations, and translations. The Jātakas serve as a source of creation in literature, ancient and modern. They have more interestingly been recreated in diverse art forms, such as architecture, sculpture, painting, theatre, dance or oral recitations. 4The corpus of the largest and best known Jātaka collection contains five hundred and forty-seven tales arranged from the very short tales to the longest one, bringing together pieces that could otherwise be classified as belonging to other genres: anecdotes, romances, fables, heroic dramas or dramatic interchanges, or else narratives that bear a certain resemblance to epic, drama and even novel. Bodhisatta, present in all of them in varied forms, assumes the role of a saviour of humans or animals through courage or skill. However, his character and/or his motives remain open to interrogation in many tales. 5For all this diversity in terms of genre, characters, motives and themes, a unifying element can be found in all the tales, i.e. the theme of not-self and impermanence, Bodhisatta’s identity being dissolved at the end of each tale and moving from one background or context towards another. If each tale can be read independently of another, together as a whole they offer a structure of continuity from one tale to the next. 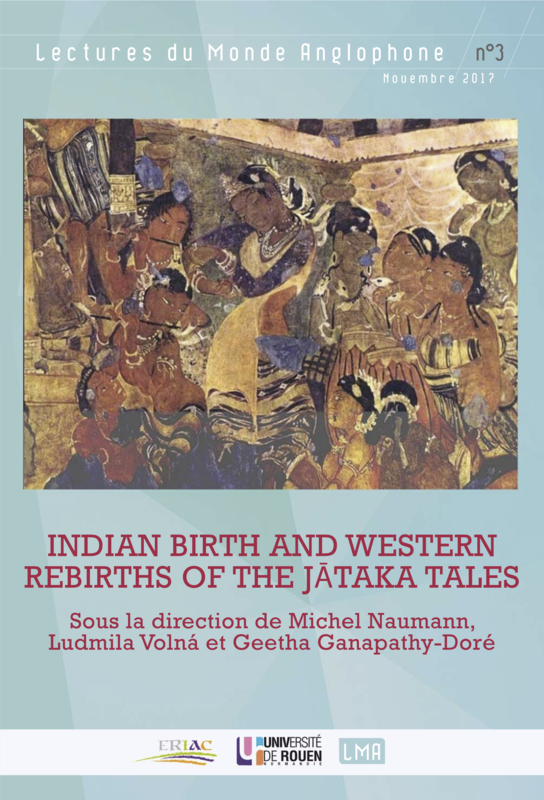 6The 2016 SARI international colloquium was devoted to exploring the relevance of Jātakas as a culturally determined text and as a universal source of narrative art comparable to the Katha Sarit Sagara or the Arabian Tales that had enriched the Anglophone world and European Literature as well as Buddhism as a political ideology in the subcontinent. If ever there is a topic that can reconcile oritentalists with postcolonialists, the return to and the re-reading of the Jātaka tales is one because the Jātakas combine the simplicity of folk tales with the complexity of philosophy and lend themselves to multiple interpretations. 7This volume, quite naturally, opens with Naomi Appleton’s discussion on the early history of the jātaka genre while questions are put forward about its relation to other bodies of pre-modern Indian literature as well as about those characteristics of the tales that make them distinctively Buddhist while allowing the inclusion of wider Indian narrative motifs. 8The way in which various aspects of everyday lives of ordinary people are depicted in the Jātaka tales and especially of those subject to abuses of political power, patriarchal mindset or disregard due to the vulnerability of old age is what interests Neekee Chaturvedi whose study points to the impossibility for these marginalized groups to struggle their way entirely out of subordination. 9Michel Naumann’s concern is with a view from the outside, an indirect one, on Buddha’s origin and life as discussed by non-Buddhists such as Marco Polo, Ibn Battuta and Anténor Firmin. Their observations and opinions are different or distorted due to political or religious factors, but often filled with admiration and respect towards Buddha’s life and teaching and even for the Buddhist tales, even if the many lives described there are not considered as incarnations of Buddha. 10Travelling of the Jātakas, in the form of translations and adaptations in languages as varied as Pahlavi, Arabic, Hebrew, Latin, Spanish, Italian and English, results in a number of variations depending on the diverse historical and cultural contexts. Subhendu Mund explores these many paths together with the intertextuality of the original tales as well as their multiple overlappings. 11The multicultural perspective is adopted in yet another essay that also puts even more emphasis on the idea of birth, re-birth and new beginnings. The various features of the water imagery relating to different cosmological backgrounds, their distinctive similarities together with aspects that make each of them significant are brought to the surface by Ludmila Volná in her comparative analysis dealing with the “Devadhamma Jātaka” and the libretto of Antonín Dvořák’s opera Rusalka. 12Artistic adaptations and variations are dealt with in a couple of other essays. It is the figure of Buddha that is the subject of representations in the two works discussed by Jayita Sengupta. While Romio Shrestha’s narratives of aesthetic imagination in the thangka paintings, Buddhas of the Celestial Gallery, offers a spiritual philosophy of amity in presenting the Buddha as a celestial figure, Bani Basu’s historiographic metafiction The Birth of the Maitreya can be, due to its perception of Buddha not as a saint per se, but more so as a man of impeccable diplomatic skills and ambition to reign the world through his newly formed religious principles, classified as the political philosophy of amity. 13In their joint creative work based on Rabindranath Tagore’s song entitled Hriday aamaar prakash holo, a piece as resonant in Britain today as it was in India throughout the twentieth century, Chris Dorsett and Janaki Nair come to a conviction that hearing a slow cross-fade between different versions of the song requires something like a jātaka-style storytelling to explore the feelings involved and consequently, they adapt the Jātaka tale known as the Power of Rumour. While mixing together their two fields of interest, viz., the sculptural experiments shaping contemporary art and the long-established traditions of Indian dance now informing multicultural performance work, the essay offers truly mingled conjunctions of a jātaka narrative, a Tagore song, two Titian paintings (The Three Ages of Man and Nymph and Shepherd) and a Kathakali mudra (dola hasta). 14The rewritings of the Jātakas in colonial and postcolonial texts are discussed in papers that follow. The former is studied with regard to Rudyard Kipling’s work, and particularly to Just-So Stories, which are, as Maria-Sabina Draga Alexandru argues, directly informed by the Jātakas and the Buddhist background associated with them. According to her, the Jātakas underlie Kipling’s understanding of both the cultural traditions of India and the dynamic relationship between the empire and its colony. She sustains that the Jātakas play a crucial role in the world image reflected in his fiction. 15While in pre-Independence India the Jātakas fuelled the imagination of people to forge symbols for the new nation, Mahatma Gandhi and Rabindranath Tagore counterbalance this colonial agenda with a parallel engagement with the repository of cultural memory invested in the Jātakas, as Debashree Dattaray sees it. The tales, according to them, not only reflect the pluralistic geography of the subcontinent but also help to reconstruct the past and create meaning for a changing present. This essay further explores the reception of the Jātakas in twentieth century India and how it thrives on the concepts of plurality and inclusiveness while mobilizing the categories of “caste”, “class”, “religion”, “tradition” and “modernity” to define alternative understanding of “individual” and “community”. 16The Jātaka tales constitute a central strand among the Indian traditions that Intizar Husain draws from when dealing with the trauma of Partition, migration and exile, Nishat Zaidi notices. As the ethical fabric of the Jātakas permeates the moral universe of Husain’s fictional work, his engagements are with the vexed and knotted histories of Hindus and Muslims and the hope of recuperating a world which is not man-centric and which holds possibilities of the good and the moral, while searching for meaning at the time of the moral crisis caused by Partition. 17Another subcontinental writer, Martin Wickramasinge, is studied by Anupama Mohan who comments on his essay on the Jātakas upon which Wickramasinghe drew to examine the modes of realistic writing that he felt best represented Ceylonese life and culture. Her article explores the author’s discussion of specific Jātaka tales with the aim of understanding what constituted the locus vivendi of Sinhala literature for him in the middle of the last century. It is a template that provides a compelling counterpoint to the adaptive examples one finds in India, where The Jātakas remained at the peripheries of the question of realism. As realism took on very different functions in Indian literatures, the analysis moves towards an orbital reading of these multiple traditions bearing upon the pivotal legacies of The Jātakas. 18Contrary to writers who deal with Sri Lankan politics through the prism of human rights Manuka Wijesinghe offers a rather bold, satirical and fictional evaluation of Buddhism as political ideology in her fiction. Geetha Ganapathy-Doré analyzes the different strategies this author uses to bring home her point: the deconstruction of the Sri Lankan “obsession with Buddhism” during the 1970/80s, a subtle confrontation of tribal knowledge, Buddhist learning and Western education in a feminist perspective, and a mixing of different literary forms and narrative resources (Jātakas, mythology, epics, tribal customs and stories of the Muslim minority). Manuka Wijesinghe’s purpose is to defend cultural diversity as the only path to non-violence in contemporary Sri Lanka. 19Cultural diversity is also what is reflected in the wide scope of papers brought together in this collection of essays, written by scholars coming from many different parts of the world. The paradigm of “enlightenment” through constant rebirth permeating the Jātaka tales, intended to lead the reader through different realms of exploration of the mind, can be perceived as a metaphor of different, varied and constantly renewed perspectives on what surrounds us, while the alleged existential denial of the world can be understood as a way of entering into it further. 20The concluding article of the volume on the affective multitude by Jon Solomon swerves from the beaten track by choosing to look at the historical opening created by the mistranslation of the word Bodhi by Enlightenment in the West. Sifting through metaphysical concepts and theories from the East and the West, Jon Solomon proposes a transcultural meaning of Enlightenment by demonstrating how “the process of translation itself is… a practice of Enlightenment” (199). 1 Cf. Sarah Shaw, « Introduction », in The Jātakas: Birth Stories of the Bodhisatta, trad. Sarah Shaw, London, Penguin, 2006, p. xix-lxvii.